I love it when a recipe that is easy, delicious and timely crosses my path. Just such a perfect event happened earlier this week. It was late afternoon and I was craving a little something sweet (but it's me, so not too sweet) but didn't feel that I had the time or the energy for a whole batch of cookies, nor did I want the calorie overload. In checking my Facebook feed, I found the perfect solution. Simple Bites had just posted about a chocolate and jam tea cake. I pulled up the recipe and loved the fact that it was touted as a "way to use up last year's preserves" (got those) but was also a tiny bit disappointed that it called for a lot of butter and whole milk -- not quite stealthily healthy enough for me as a snack. As I did so, it occurred to me that, while I am not by a long shot the best or most inventive cook I know, I am proud of how much my skills have improved and my knowledge grown since I started this blog three years ago. (Remember, I didn't really know how to cook much at all until I was nearly 30.) Practice makes perfect, right? I'm thrilled finally to have the confidence and the courage in the kitchen to look at a recipe and adapt it for my own needs and tastes; to pour the salt into the palm of my hand and know, by sight and by feel, when it equals a half teaspoon; to know instinctively when a cake looks done and ready to test, instead of obsessively opening the oven door and poking holes in it with a toothpick every two minutes in the last 10 minutes of baking time. I've been on a journey, schooling myself in a new craft for the past three years, and I hadn't quite realized it until now. This is not a place, a skill level, where I ever thought I'd find myself. But, then again, neither is Vermont. Life is a journey: enjoy the entire ride. 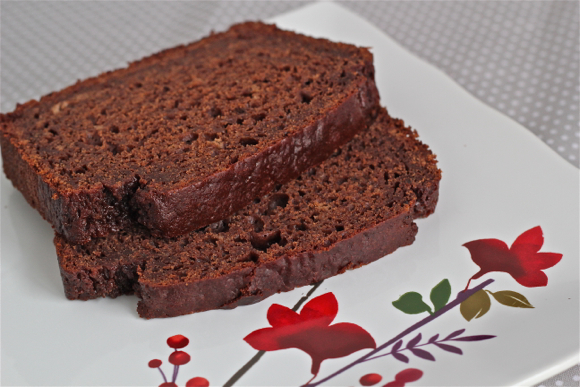 This bread is moist and chocolately with just a hint of berry flavor. It's lovely all on its own, as a snack, but you could also add a half-cup of chocolate chips to the batter to make it more desserty. Also, if you substitute a different flavor of jam, I'd love to hear about it. In a smallish bowl, whisk together the flour, baking powder, salt and cocoa. In another larger bowl, beat the eggs lightly, then whisk in all the remaining ingredients. Add the dry mixture to the wet and stir until combined. 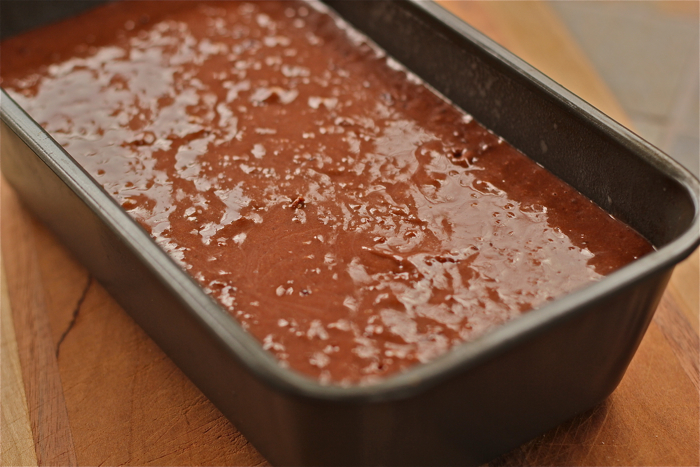 Pour the batter into a prepared loaf pan and bake for about an hour (check at 50 minutes) or until an inserted toothpick comes out clean. Cool on a wire rack. This is terrible, I'm drooling all over my keyboard. If I move to Vermont, can I just come and eat at your house all the time? Jeez -- is promising to feed you all it would take?!! Come on up! What a load off, I'll never have to cook again. woot! Except... can you imagine Mr. Achmed in Vermont?! You'd be surprised -- I think he would love it! Just whipped this up last night with raspberry preserves instead of strawberry. Enjoying a slice now this morning with my coffee as I read through work email and get started with my day. I can tell it's going to be one of those days so I'm so very happy with my chocolaty goodness to get me started. YUM! Awesome! Thanks for the feedback. Ok I made the bread yesterday and it came out great!!! Just what I wanted :) I used the puree instead of the jam and it seemed to work out just fine. I even added a few dried strawberries as well. Delicious...thank you!